Charming wanders through the castle. He hears a baby cry. He enters Emma’s nursery and tells himself this is impossible. Emma appears to him. She is grown up in a ball gown. She tells him tonight is her first ball and he must teach her to dance. Charming enjoys teaching Emma to dance until she tells him she is not really there because he failed her. The room turns dark and windy. The wardrobe opens and Charming tries to hold onto Emma. She tells him it is too late and not to fail the next one. Charming wakes from this nightmare. He pulls himself together as Snow tells him she has news. She tells him she is pregnant. Charming tells her that he is thrilled. The truth is Charming is scared. He sneaks into the stable and drinks from a flask. Robin finds him there. Charming confides to Robin his fears. Robin tells him there is a root he can take that will take his fears away. He tells him how to find it but warns that there is a legend that part of the forest is haunted. Charming finds the night root that Robin told him about. As he collects it he hears a woman call for help. He finds a tower. Charming climbs vines. Once the vines end he grabs onto what looks like a long braid of jet black hair. He climbs the tower using the braid and when he enters he finds the hair belongs to a princess. She introduces herself as Rapunzel and explains she has been trapped here by a witch since she too came for night root. Charming wants to take her home but she is in fear of the witch. Charming looks outside the window and sees a cloaked witch climbing the castle. 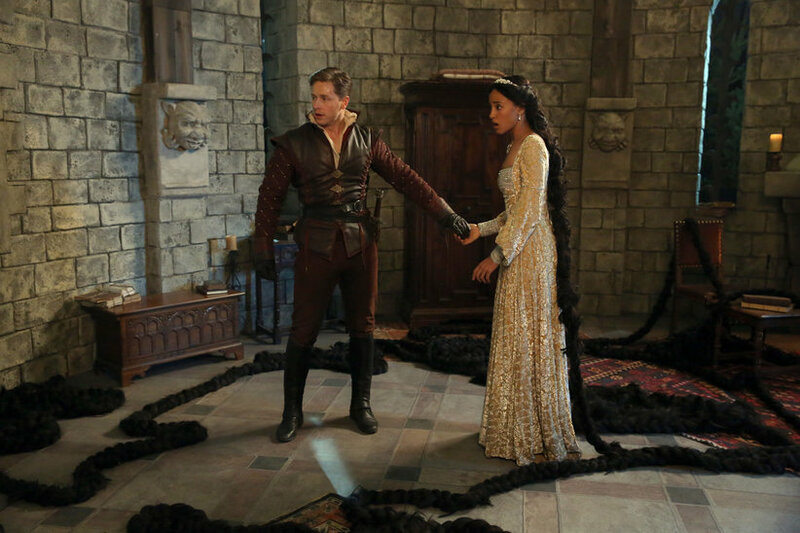 Charming tries to cut away some of Rapunzel’s braid to cause the witch to fall. The witch is able to make it to them. Charming is shocked when the witch reveals herself and has the face of Rapunzel. He tells Rapunzel that the witch is an image of her fears and she must face them. He is able to pull the witch out the window. As she begins climbing back in Rapunzel gets the courage to cut off part of her hair. The witch falls and disappears. Rapunzel tells David about a family tragedy that led her to seek the night root. She admits she does not believe she is fit to be a queen. He takes her home and her family is excited to have her back. Snow is there and asks what he was doing there. He admits that he was scared after everything that happened with Emma. Snow reminds him they will do this together. I express that I do not think Henry should be alone with a wicked witch on the loose. Everyone agrees. Zelena visits Rumpelstiltskin who is furiously spinning straw into gold. She taunts him and then reminds him she holds the dagger and controls him. He tells her he does not know why she has not just killed him. She has other plans and talks about keeping up appearances. Zelena decides to use the dagger to shave him and tells him she learned to shave a man because her father was a drunk. She nicks him and shows him his blood. As she goes to leave he asks what she really wants. She does not tell him but assures him she will get it. Zelena goes to Gold’s shop which Belle now runs. She tells her she wants a gift for Mary. As Belle turns she freezes her and goes into the safe. She helps herself to some night root. At my office David finds traces of holly berry on the floor and tells Emma and Hook where it comes from. David gets a text from Mary to meet the midwife. He looks less than thrilled but Emma tells him it is okay to go. David comes home to Mary telling Zelena how they met. Zelena gets up to make them tea. David tells Mary he is concerned they do not know who this woman is. Meanwhile Zelena laces David’s drink with night root. David calms down as Zelena tells them they should feel free to speak of their fears so they can work through them. David tells them he has none and everything is great. He leaves them. David goes to the forest where the holly berry is. He does not see he is being stalked by a cloaked witch. I buy Henry some ice cream and we walk through the park. He gets comfortable with me. He tells me he knows something is not right with Emma. She would never pull him out of school like this. He tells me that she was almost engaged to Walsh and he thinks she left because of him. Henry admits he wants it to be more than just the two of them. I tell him one day he will have more family than he knows what to do with. Hook and Emma explore the forest. Emma tells Hook she believes there is something that happened with him that he is not sharing with her. Hook evades her statements and asks if Walsh broke her heart. He admits he is glad because it shows she can still feel. He leans into her but she pulls away. They find a farm house. David is in the forest. He hears a strange noise. He finally gets a glimpse of the cloaked witch. He calls Emma and leaves her a voicemail that he is following the witch. The witch attacks David who appears unconscious. Emma and Hook look through windows of the farmhouse. The find a locked cell and Emma wants to go in. Hook stops her and suggests they get backup as they do not know what can possibly be there. As she goes to call me she sees a missed call and listens to David’s message. David clutches his sword and stays still. He then goes to attack the witch. The sword goes through but the witch still stands there. The hood is pulled back and the figure has David’s face. The thing tells him that he is him. David battles his doppelganger who is able to cut David’s sword in half. Once David sees Emma’s car pulling up he is able to kill the witch. I arrive with Hook and Emma and we see David alone and shaken up. He explains it was himself. I tell them the Wicked Witch is toying with us. I ask David where his sword is. He explains what happened and I am able to figure it out. The sword is gone because it has a piece of his courage that was taken with it. Meanwhile Zelena looks in her bag and sees David’s severed sword. An unsuspecting Mary hugs her as she leaves. We return to the farmhouse to see the lock on the cellar broken. We go in and find an empty cage. Whoever was here has escaped. I smile when we find straw that has been turned to gold. We now know that Rumpelstilstkin is alive.